How about a radio controlled watch? Yes, you read it right. 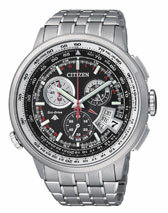 Citizen’s (Calibre H610) is the Company’s first analogue chronograph capable of receiving standard time radio waves from multiple stations. A radio controlled watch receives standard time radio waves that are broadcasted from radio wave transmitters and uses these waves to automatically correct the time and date. The watch is designed to receive standard time radio-waves from five stations including Germany, the U.S.A., Japan (east and west), and China. As a result, it not only offers greater accuracy but added convenience too. For world time, users can choose from 26 cities and UTC (Coordinated Universal Time). Simply turn the dial disk using the crown to switch the city. Doing this allows you to easily adjust the hour and second hands to the time zone of the city selected. The pilot’s slide rule dial ring located beneath the glass and the precise 1/5 sec. chronograph symbolise the concept of an elaborate and masculine design that imparts the image of an airplane cockpit. As the new radio control watch comes with an ‘Eco-Drive’ platform, it keeps running on any kind of light. Whenever exposed to any source of light, the watch charges itself and sustains even when kept in dark for some time. Price Rs. 66 k.
watchalive syndicates its weblog posts and Comments using a technology called RSS (Real Simple Syndication). You can use a service like Bloglines to get notified when there are new posts to this weblog.